Michal Orlowski posted a convincing TQ run in the opening round of 4WD qualifying at the fourth round of the EOS in Trencin, Slovakia, this evening. The Schumacher driver, who was the no.2 seed for qualifying, opened with a rough first lap but then settled in taking full advantage of two mistakes from top seed Bruno Coelho. With Coelho and Orlowski a step above their competitors at the Hudy Arena, Coelho’s first mistake came on the fourth lap allowing Orlowski to go by and set the pace from the front. At the end of the 5-minutes it would be Martin Bayer who would finish P2 almost 4.5-seconds off Orlowski’s pace. Despite a second and lengthy flip later in the run, Coelho would salvage a P3 from the run being the only driver to register a 21-second lap. 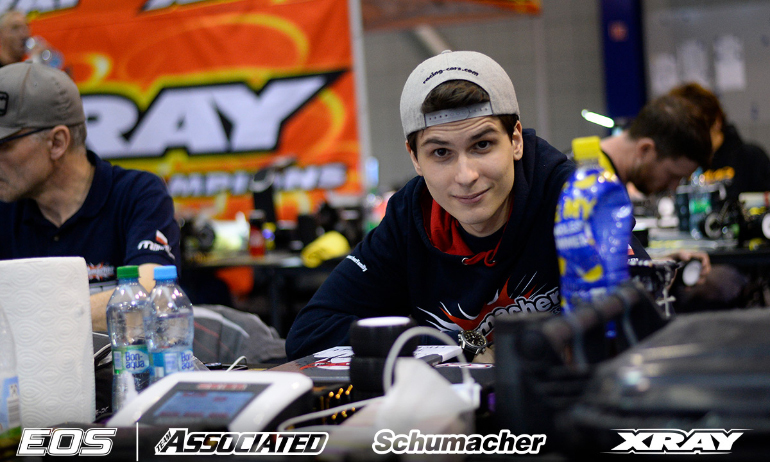 Backing up his 2WD A-Main appearance earlier today, Hungarian teenager Adam Izsay took his Xray to the fourth fastest time followed by No.3 seed Daniel Kobbevik and Hupo Hönigl.